Mercury reaches greatest elongation east on July 30th, when it moves out to 27.2 degrees from the Sun. From Southern Hemisphere locations, the planet can be seen early in the month low down towards the northwestern horizon just after sunset. Visibility then improves gradually each evening until greatest elongation is reached. For example, from latitude 35S (approx. equal to Sydney, Cape Town and Santiago), Mercury will be 16 degrees above the horizon, 45 minutes after sunset. From the middle to the end of the month, its magnitude decreases from -0.5 to +0.3. 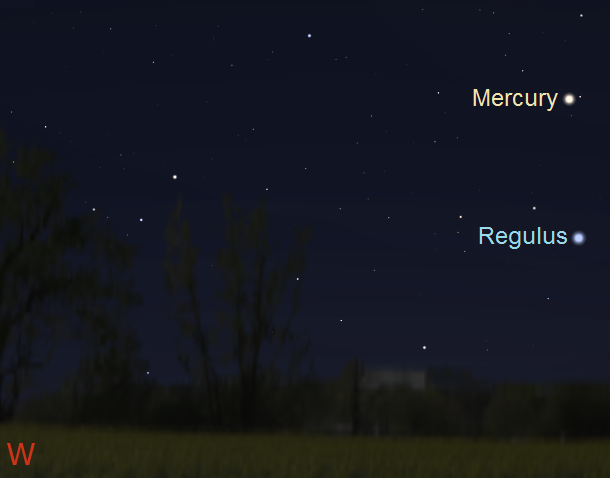 On July 25th, the thin crescent Moon passes less than a degree north of Mercury and on the following day Mercury passes a degree south of Regulus (mag. +1.4). From mid-latitude northern temperate locations the planet isn't so well placed, but can be spotted hugging the western horizon near the end of the month. Venus remains a brilliant morning object. From mid-latitude northern temperate locations the planet's visibility actually improves slightly during July. It rises about 2 hours and 45 minutes before the Sun at the start of month, increasing to about 3 hours by months end. From southern temperate locations, Venus rises up to 3.5 hours before the Sun on July 1st although an hour less by July 31st. As the month progresses, the planet fades slightly from magnitude -4.2 to -4.0 with its illuminated phase increasing from 63% to 74%. On July 14th, Venus passes 3 degrees north of Aldebaran (mag. +0.9) and on July 20th the waning crescent Moon passes 3 degrees south of the planet. Mars reaches solar conjunction on July 27th and is therefore unsuitably placed for observation throughout the month. Although fading, Jupiter remains a brilliant evening object moving direct in Virgo. It's visible towards the west as soon as it's dark enough. However, by months end it sets before midnight from northern temperate latitudes, although slightly earlier for those located further south. As the month progresses, the giant planet fades from magnitude -2.0 to -1.9 with its apparent size decreasing from 37 to 34 arc seconds. 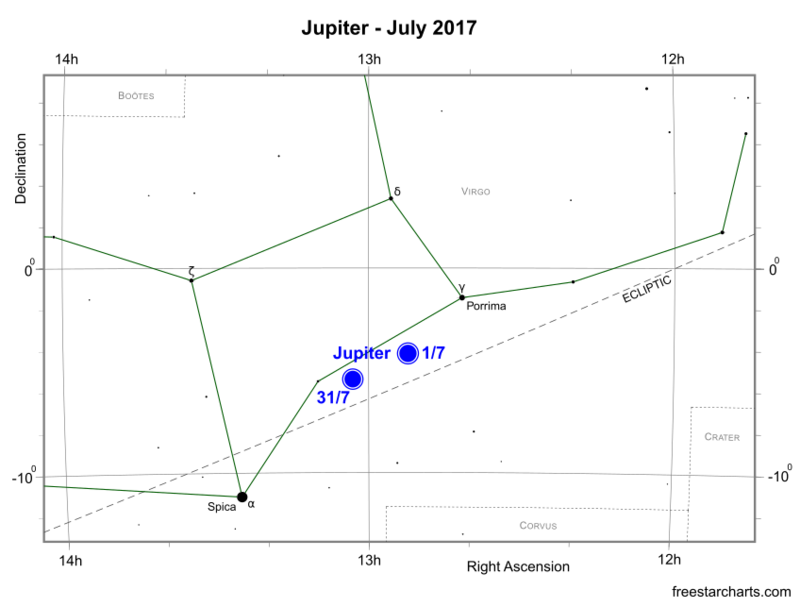 On July 1st, the waxing crescent Moon passes 3 degrees north of Jupiter. 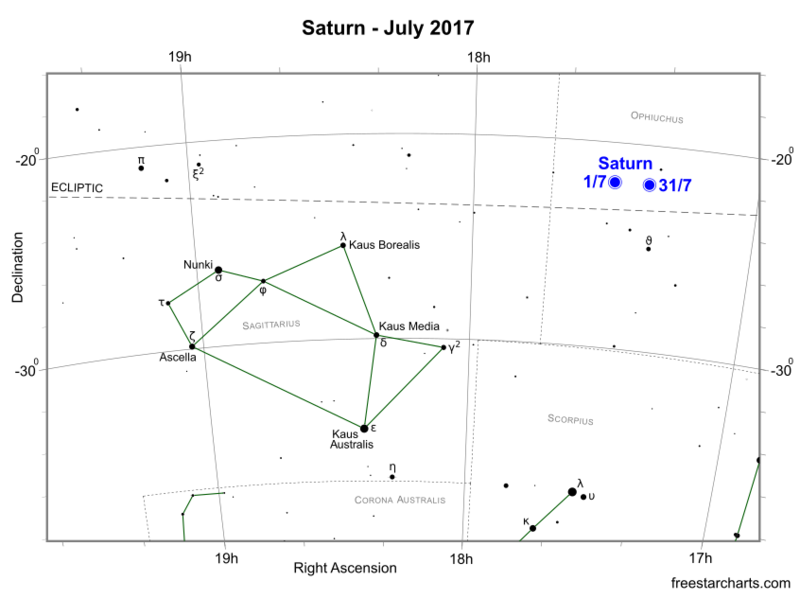 Saturn remains well placed for observation throughout July. 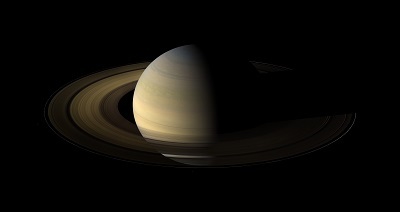 The "Ringed" planet is only a month passed opposition and is visible after sunset. It then remains observable for most of the remainder of the night. Saturn is currently moving slowly retrograde in Ophiuchus close to the border with Sagittarius. With the Earth slowly distancing itself, the apparent brightness and size of the planet continues to decrease. Its magnitude fades from +0.1 to +0.3, with its apparent diameter shrinking from 18.3 to 17.8 arc seconds as the month progresses. Saturn's wonder of course is its ring system. They are currently wide open and even a small 80mm (3.1-inch) scope will easily show them. Larger telescopes display much detail. For example, a 200mm (8-inch) reflector under good seeing conditions reveals the 0.7 arc seconds wide Cassini division, the Enke division, the hazy C-ring and up to half a dozen satellites. On July 7th, the waxing gibbous Moon passes 3 degrees north of Saturn. Uranus, mag. 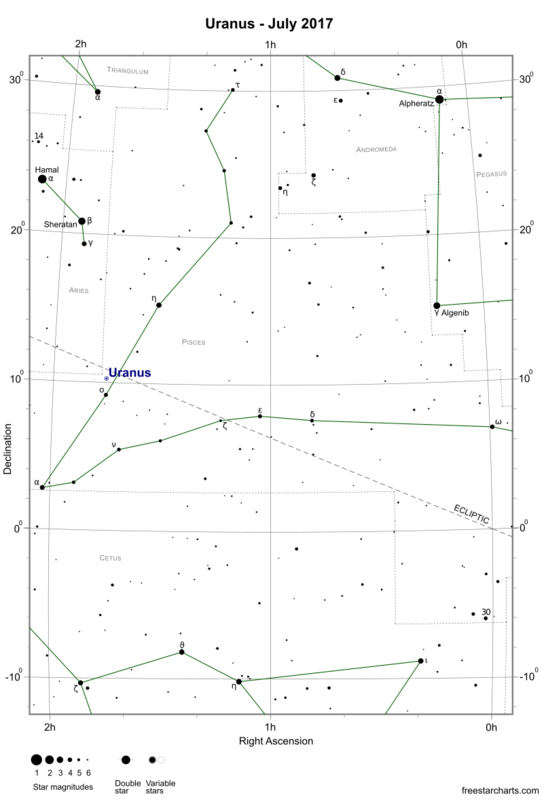 +5.8, is located in Pisces close to the border with Aries. From mid-northern temperate locations at the beginning of the month, it rises 4 hours before the Sun. By months end, it can be seen an hour or so after midnight. For those located further south the visibility period is slightly better still. Under dark skies Uranus is faintly visible to the naked eye, although from most populated areas optical aid is required. The planet is positioned a degree north of omicron Psc (ο Psc - mag. +4.3). On July 17th, the last quarter Moon passes 4 degrees south of Uranus. Neptune continues to move slowly retrograde in Aquarius. With opposition now a month away, the distant planet is now well placed for observation. At the start of July, it rises after midnight from northern temperate latitudes. From further south, it's even better placed and visible up to a couple of hours earlier than that. 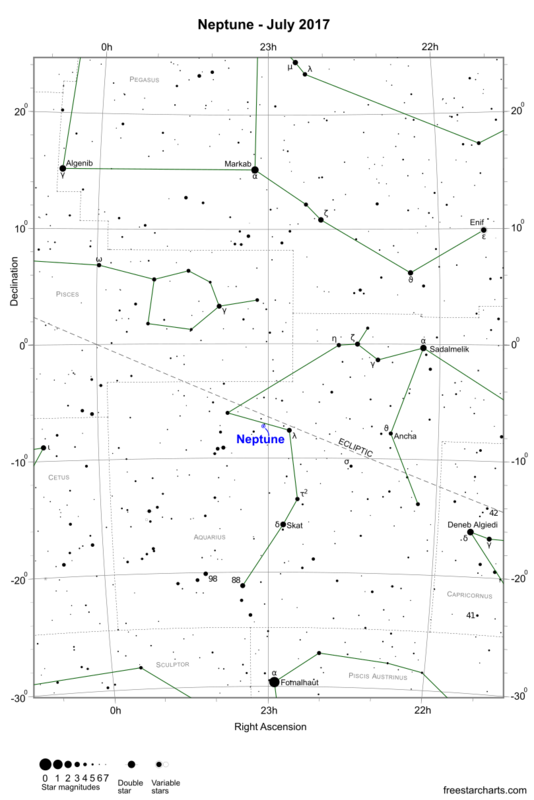 Neptune is located 30 degrees south and slightly west of the centre of the Great Square of Pegasus. Lambda Aqr (λ Aqr - mag. +3.7) is positioned 2.5 degrees west-southwest of the planet. Neptune is the only planet that's never bright enough to be spotted with the naked eye. However, it's relatively easy to see with binoculars or small scopes. Neptune brightens marginally from magnitude +7.9 to +7.8 as the month progresses. On July 13th, the waning gibbous Moon passes a degree south of the planet.